Disclosure: I received 2 bottles of Softsoap from Colgate-Palmolive for review purposes. 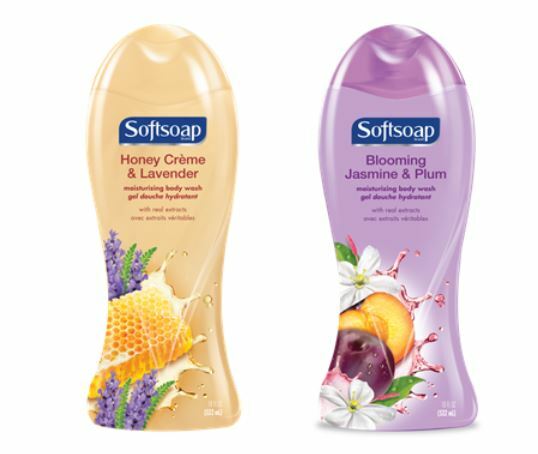 Softsoap Fragrance line has a NEW Softsoap Honey Crème & Lavender Moisturizing Body Wash and NEW Softsoap Blooming Jasmine & Plum Moisturizing Body Wash out now! Your signature scent says a lot about you, and we all love to try out different scents based on the season or even where we’re headed that particular day. So what better way to experiment with fragrance than in your shower? Inspired by trending ingredients. the newest additions to the Softsoap Body Was line are crafted with real extracts of honey, lavender, jasmine and plum. These indulgent fragrances will transform your shower into an invigorating sensory experience, all while moisturizing and cleansing your skin. Honey Crème & Lavender - a moisturizing body wash with a rich, fragrant lather. With extracts of honey and lavender, it is designed to be gentle enough for daily use. Leaves skin feeling soft and smooth, and leaves you feeling refreshed. Blooming Jasmine & Plum - a moisturizing body wash with a luxuriously rich, fragrant lather. With real extracts from jasmine and plum, it is designed to be gentle enough for daily use and leaves skin feeling soft and smooth, for a refreshing and energizing shower experience. To celebrate this launch, I was challenged to forego normal daily fragrance and instead, indulge in a fragrant shower experience with Softsoap. I prefer just to shower and go and not add perfumes or other scents. I love the way my skin smells and feels after my shower with Softsoap moisturizing body wash. Not only does my skin smell great, but the so does the bathroom. I have to fight my daughter most the time for my body washes as she is a huge fan too! The true results of this was when my son who is nine was snuggling against me on the couch. He said that I smelled so good and wanted to know if I was using perfume. I told him no... it was just my body wash from the shower! I don't have a favorite yet, I love both the scents and have them both in my shower at the same time. I switch off each day on which scent I will use! Is Honey Crème & Lavender your signature scent for a girl’s night in or a movie night with family? Or is Blooming Jasmine & Plum a go-to for an early morning meeting or workout class? Don’t be shy, tell us what you think in the comments! Head over to Softsoap to check out the great selection of products they offer. This new lineup is at mass retail, drug, and grocery stores nationwide now! Stay connected: like Softsoap on Facebook for all the latest news and promotions. One lucky reader (US Only) will win their very own set of this new Body Wash Duo! This giveaway ends February 20th, 2017. For your chance to win, enter below on the Rafflecopter.